Here's an entry coming to us all the way from Hawaii! This young man is 3 year old AJ. AJ is wearing a Homemade Costume that cost only about $10.00 to make. 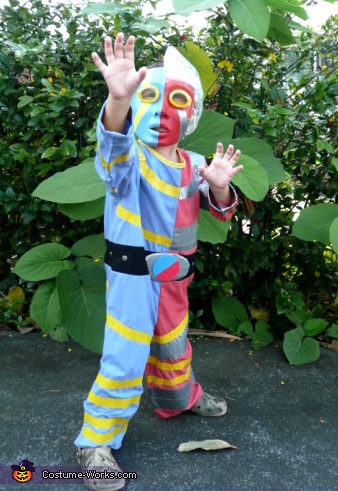 The Costume is of "Kikaida" an Android Superhero created in Japan. It played in Hawaii about 35 years ago. AJ's Mom, Sabrina, says that her son loves to do all of the stances and action moves that SuperHero Kikaida does. LOVE KIKAIDA! Glad to see a new generation of kids growing up appreciating it! !